Consider yourself lucky if you’re not familiar with the pesky stinkbug. These insects have migrated to portions of the US from China. They multiply by the millions and destroy crops such as apples, tomatoes and virtually all other fruit that they stumble upon. They don’t bite or sting, they just irritate everyone they’re near. In the fall and winter, they hide inside your home. When you least expect it, they appear on a wall, a couch, table, your bed or whatever. During cold months, you might come upon 2 or 3 stinkbugs every day! My son, John and I have been having fun exploring unique methods of killing these worthless bugs. Here’s a look at a nesting pair of American Bald Eagles that have built a 6′ wide nest, a little over 1000ft from the Great Allegheny Passage bike trail, a few miles south of Pittsburgh, PA USA. The male and female have one rather large “eaglet” in their nest. He looks almost ready to fly. As a commercial director/cinematographer, this was my first experience with nature photography. I’m used to planned projects and production schedules. I now have complete respect for the men and women who shoot nature photos and videos. Every scene in this video was shot from about a quarter mile from the birds and their nest. At this distance, the birds aren’t really noticeable to the naked eye. It’s great that the American Bald Eagle has made a complete comeback from near extinction. They are now in every US state except Hawaii. We have 3 nesting pairs in the Pittsburgh area. They hunt in a radius of several miles from their nest and can easily lift small animals weighing up to 4 pounds. 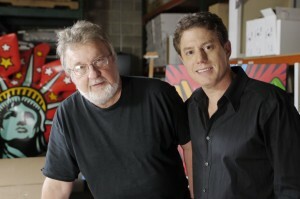 Just finished shooting an internet video project with Burton Morris, one of the country’s hottest artists. I love his energetic, vivid, fun style of unique “Pop” art, which is a tribute to artists Andy Warhol and Roy Lichtenstein. Although Burton now resides in L.A., he has family and professional ties to his home town of Pittsburgh, PA. A graduate of Carnegie Mellon University (CMU) Burton started his career as an art director at several major Pittsburgh ad agencies. Burton Morris has created major works for CocaCola, The Academy Awards, Heinz, the Olympics, Absolut Vodka and hundreds of other corporations. Although he’s an internationally famous artist, Burton Morris’ is also one of the nicest guys you’ll ever meet. He just completed a fun project for Eat ‘n Park Restaurants. Burton created his own original art to celebrate the 25th anniversary of “Smiley,” Eat ‘n Park’s corporate cookie icon. This summer, Burton Morris’ original artwork will adorn t-shirts, coffee mugs and other items that are sold in Eat ‘n Park’s chain of over 80 restaurants. Sorry, I can’t reveal Burton’s original “Smiley” artwork, ’till it’s unveiled in June!… stay tuned!